Alright let's talk about the atomic orbitals. So we ideally had the idea that atomic, an atom looks like and the nucleus in the middle positively charged nucleus with the electrons orbiting around it. We're not going to use that model anymore, it's extremely outdated we're going to ignore it, it's great for simplistic ideas of how atoms behaves but now we're going to talk about, we're getting more to Chemistry we're going to talk about more in depthy. So we're going to now use the more updated model which is the quantum chemical model. So Schrodinger along with Heisenberg came up with a new idea what an atom looks like it's the one we used today Heisenberg uncertainty principal states that it is impossible to know precisely both the velocity and location of an electron at the same time. And he along with Schrodinger which is he kind of like calculated this huge mathematical idea where electronic can be found came up with this new idea what an atom looks like. So if we go over here, we're going to actually try and describe where an electronic can be located within an atom. So if you have a nucleus in the middle, here is the nucleus and back here is where the electrons are located, we are going to, there are different energy levels the principal energy levels where electron can be found. So in the principal of energy level n=1 n is basically which principal energy level is which. We are going to have, we have one orbital, we're going to call it the s orbital and let's give an idea of what the s orbital actually looks like. 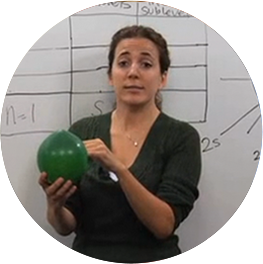 If we take this balloon it's a spherical balloon s orbitals are spherical in shape in the middle we have a nucleus and surrounding it we have the idea of where the electron can be found. So there is one orbital for every s in s orbitals there's only one looks like this. So we're going to say 1 and then n equals 2 principal energy level there's an s also with a bigger sphere and there's also p orbitals. Okay, p orbitals look slightly different, this is what a p orbital looks like this is one even though there are two balloons this is one p orbital. The nucleaus is kind of where the knots are and the electrons can be found either here or here and it look likes a dumbbell shape. If there are actually 3 of these orbitals together they come together to look like this complicated mess. So electrons can be found in anywhere the balloons are so the nucleus is obviously in the center and the electrons can be found and there are three of them put together to make the dimensional shape. So in the n=2 we have 1 s orbital and then we have three p orbitals. In the n=3 it also has s orbitals, it also has p orbitals but it also has a d orbital, d orbitals looks like flowers there are more complicated I didn't get a chance to make it in balloons because it's a little bit harder but it looks like a clover. And so the nucleus is found here and the electron can be found at four of these places. Now this is just one orbital this is not four orbitals, so electrons can be found here, here, here or here. So there's 1 s orbital 3 p orbitals and 5 d orbitals. They can be oriented in different ways along the axis. The n equals 4 principal energy levels you have an s also, you have a p again you have a d and then you also have an f orbital. f orbitals are extremely complicated each orbital actually looks very different from each other so I'm not even going to attempt to draw it because each one is a little bit crazy. But there's one s orbital, oops I'm sorry about that, three p orbitals, 5 d orbitals and as you can guess there are 7 f orbitals. An f is actually for now the highest energy orbital that we can be able to find. There are theories that are other orbitals within the principal of energy level however we're not going to go there because it's just theoretical at this point. So if you were to put all these guys together you get this insane mess looking thing the nucleuss being here, the s orbital the electron can be found within that then the 3 p orbitals then the s and so on and so forth. So it is a lot more complicated than the board model which is just a nucleus in the middle and electrons surrounding it. This is basically the atomic orbital.